Background Mentoring is important for personal and professional development of doctors. Peer mentoring is a core skill in the UK paediatric postgraduate curriculum. However, there is a paucity of peer mentoring programmes aimed at postgraduate doctors in training (postgraduate trainees), and there are no such schemes within paediatrics described in the literature. We developed a regional peer mentoring programme for postgraduate trainees in paediatrics to assess demand and need for peer mentoring and to explore the benefits for both peer mentees and mentors. Programme design Junior postgraduate trainees, randomly selected from volunteers, received peer mentoring from more senior trainees for 1 year. Peer mentors were selected by competitive application and undertook tailored training followed by an experiential learning programme. The programme was evaluated using structured questionnaires. Results 90% (76/84) of first-year postgraduate trainees in paediatrics applied to participate, demonstrating high demand. 18 peer mentor–mentee pairs were matched. Peer mentors and mentees reported high satisfaction rates, acquisition of new and transferable skills and changed behaviours. All peer mentors intended to use the skills in their workplace and, later, as an educational supervisor. Conclusions Our programme represents a novel approach to meeting the demonstrated demand and the curriculum requirement for peer mentoring, and enabled peer mentors and mentees to develop a valuable and versatile skill set. To our knowledge, it is the first such programme in paediatrics and provides a feasibility model that may be adapted locally to allow education providers to offer this important experience to postgraduate trainees. Mentoring is a key tool for personal and professional development within the medical profession. The importance of peer mentoring has been recognised in academic medicine and to support newly qualified consultants and doctors in difficulty. Although peer mentoring is a core skill specified in UK paediatric postgraduate training programmes, there are no such schemes within paediatrics described in the literature. There is high demand for peer mentoring in paediatrics. The programme was highly valued by participants, who gained significant benefits, including acquisition of transferable skills and positive changes in behaviour. This programme offers a successful model that may be adapted elsewhere to provide peer mentoring to postgraduate doctors in training. Peer mentoring refers to a mentoring relationship between individuals ‘equal in age, experience and rank’.4 Equality and reciprocity allows mutual support and collaboration,5 increases productivity6 and has been effective in supporting newly qualified consultants7 and doctors in difficulty.8 Two peer mentoring schemes aimed at trainees, outside paediatrics, have reported benefits.9 ,10 However, the former provided no training for mentors, the latter offered no mentee input into the matching process and neither provided ongoing support for participants. European Working Time Regulations have resulted in reduced and fragmented working hours for postgraduate trainees, including those in paediatrics. Therefore, sustained developmental relationships with experienced, trusted colleagues may be harder to establish,7 and informal mentoring relationships less likely to develop. This need has been recognised by the Royal College of Paediatrics and Child Health, whose curriculum now requires postgraduate trainees to develop peer mentoring skills.11 However, no paediatric peer mentoring schemes are reported in the literature. We developed an innovative regional peer mentoring programme. We aimed to assess demand for peer mentoring among junior postgraduate trainees and to evaluate benefits for both peer mentees and mentors. The programme was funded by the Faculty Development Department, London Deanery. Peer mentees were randomly selected from applications open to all regional postgraduate trainees in their first year of paediatric training. Those not selected were invited to participate as control subjects, with access to standard care and support pathways available to all trainees, without allocation of a mentor. Senior postgraduate trainees in their last four years of paediatric training were recruited as peer mentors by anonymised competitive application. Mentees selected their mentors from a choice of three pen-profiles. Matching within an organisation was avoided. Peer mentors undertook a 3-day coaching and mentoring course using an established model of coaching.12 The course comprised facilitated group work and active learning techniques. This was followed by a workshop introducing paediatric-specific issues and available resources. Subsequent learning consisted of regular mentor–mentee meetings, completion of a reflective learning portfolio and attendance at facilitated Action Learning Sets, promoting development of a community of practice. Mentors and mentees were briefed on the peer mentoring relationship and introduced at a social event. Training materials were developed, including information and resource packs, course materials and templates for development of a reflective learning portfolio. Training for all participants covered use of contracts, ethical guidelines and setting of agendas. All were provided with access to expert senior support. Peer mentors were advised to apply for mentorship themselves through an established local scheme. Questionnaires were completed anonymously by all participants, including control subjects, throughout the programme. The questionnaires, using Likert scale and free text responses, were developed to fulfil our objectives of assessing demand, benefits of participation and programme evaluation. Further qualitative feedback was obtained from peer mentors at Action Learning Sets using open-ended structured questions. Ethical approval was not required (Research and Development Office, Great Ormond Street Hospital for Children, London, UK). We identified high demand for peer mentoring: 90% (76/84) of junior postgraduate trainees in the region applied to become peer mentees, of which 18 were randomly selected and a further 26 volunteered as control subjects. Fifty-two senior postgraduate trainees applied for the role of peer mentor; 18 were selected. Sixteen pairs completed the programme (one mentee failed to respond to mentor contact; one mentor failed to attend Action Learning Sets). The questionnaire response rate was 100%. Pre-programme data revealed that all peer mentees and control subjects recognised the existing role of trainee colleagues in providing informal support within the workplace. Qualitative ‘free text’ data described a need for additional support independent of the workplace. 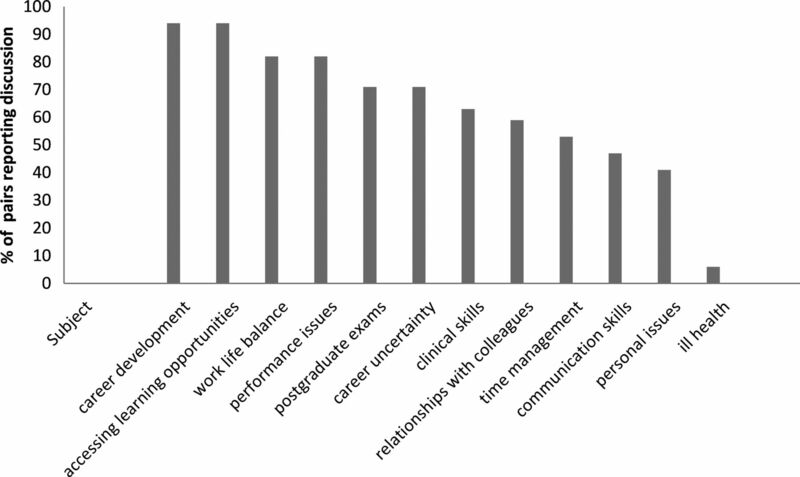 Both mentees and controls identified similar priorities for further support: optimising learning opportunities and postgraduate examinations (each 94% (17/18) mentees; 94% (24/26) controls), career development and managing work–life balance (each 89% (16/18) mentees; 94% (24/26) controls). Prior experience of peer mentoring was reported by only 6% (4/62) of all participants. One hundred per cent (18/18) of peer mentors and ninety-four per cent (17/18) of mentees found the process useful. One hundred per cent (18/18) of mentors and eighty-three per cent (15/18) of mentees enjoyed participating. Ninety-four per cent (17/18) of peer mentors perceived the training to be effective and valued the opportunities provided by the Action Learning Sets. Eighty-nine per cent (16/18) of peer mentors and ninety-four per cent (17/18) of mentees described a successful peer mentoring relationship. Ninety-four per cent of mentees felt their peer mentor had been a significant source of support (along with trainee colleagues (89%; 16/18) and friends and family (89%; 16/18)). In particular, they reported the value of ‘a confidential arena to discuss personal issues’ and the opportunity to ‘identify goals and come up with a strategy to achieve them’. The control group, without a peer mentor, also valued support of trainee colleagues and friends/family (both 94%; 24/26), but 81% (21/26) ‘wished they had been allocated’ a mentor. Although 39% of participants (14/36) had difficulty in fulfilling the time commitment required, half met four times or more. Subjects discussed were predominantly work-related (figure 1) and included professional development and accessing learning opportunities (each discussed by 94% of pairs (17/18)). Subjects discussed during peer mentoring meetings. Both peer mentors and mentees acquired a range of skills (figures 2 and 3). All peer mentors reported development of skills in coaching and mentoring. Ninety-four per cent (17/18) reported enhanced communication skills such as ‘active listening without giving advice’ and using ‘open exploratory questions’ to enable the mentee to ‘discover solutions to their goals’. All mentors intended to use their skills to support junior colleagues; 94% (17/18) anticipated using skills in a future role as a consultant or educational supervisor. Eighty-nine per cent (16/18) intended to use their skills with patients and in their personal life. Skills developed by peer mentors. Skills developed by peer mentees. Seventy-eight per cent (14/18) of peer mentees reported being more proactive in seeking learning opportunities, improved decision-making skills and stress management. Other benefits included improved relationships with colleagues, clinical and examination performance and work–life balance. Seventy-eight per cent (14/18) reported enhanced ability to manage new situations. There was recognition that such skills were transferable to other contexts: “I have these experiences and strategies to use again elsewhere”. Seventy-two per cent (13/18) of peer mentors described a positive impact on professional behaviour, including increased empowering of patients and families, especially adolescent and/or complex patients, and improved provision of support to colleagues. Forty-four per cent (8/18) reported an impact on their personal lives due to improved listening skills and a structured problem-solving approach. Peer mentees also reported changes in outlook. Eighty-nine per cent (16/18) reported improved self-confidence. Eighty-three per cent (15/18) felt a greater sense of realism: “I feel reassured that my concerns are normal for my stage”. Seventy-eight per cent (14/18) reported a positive change in their professional outlook. There was significant enthusiasm for future involvement; 83% (15/18) of mentees and 94% (17/18) of mentors intended to continue participating in the peer mentoring process. Seventy-seven per cent (20/26) of the control group expressed a strong interest in participating in a future programme. Our participants reported limited prior experience of peer mentoring despite recent recognition of the benefits of mentoring.14 ,15 This highlights a gap between demand for and provision of peer mentoring schemes, and the need for processes to facilitate training and experience in this important skill. Our programme was well received, demonstrated by high completion rates and satisfaction scores. The majority of mentees perceived their mentor to be a key source of support. Those subjects not allocated a peer mentor, after a year of receiving ‘standard support’ available to all trainees, nonetheless perceived the value of additional peer mentoring support and were keen to participate if the programme were offered again. A wide range of transferable skills was acquired by participants. One of our most powerful findings is the self-reported positive impact of the programme on both peer mentors and mentees in achieving change in behaviour. This is consistent with other studies16 and is thought to be underpinned by processes of problem-solving and change management.17 These positive behavioural changes are likely to be of benefit personally and professionally and, if sustained, may contribute to longer term professional development. Our programme provides a successful model that may be adapted for implementation in other regions or specialities. Features of the programme design we believe to have contributed to its success include our recruitment and matching process and the training provided for mentors. Voluntary participation in mentoring schemes is positively related to rewarding experiences20 and is likely to have contributed to sustained engagement. In contrast to other peer mentoring schemes,9 ,10 our programme avoided matching of mentors and mentees within one organisation, minimising risk of mentor bias (a perception of mentors as agents of the organisation)21 and confidentiality breach.22 Our matching process allowed mentee input, shown to result in greater mentorship quality.23 Formal training for mentors was key, as lack of appropriate training can lead to provision of inappropriate advice or imposition of the mentor's own views on the mentee,24 resulting in conflict and disillusionment.22 These broad principles of voluntary participation, mentee input to matching, effective training and support are transferable concepts that can be applied elsewhere. However, programmes such as ours are resource-intensive22 and the cost of training, mentor support and performance monitoring has implications for sustainability. There is, however, good evidence that mentoring is a cost-effective tool, improving staff retention rates25 and contributing to the development of clinical governance.26 By improving communication skills, it can positively impact on patient care.17 It also allows mentees to identify difficulties and access appropriate help early, reducing expensive referrals to regulatory bodies.22 These benefits should convince organisations of the value of such programmes. Although the needs and resources for peer mentoring will vary between regions, specialities and populations, the principles underpinning our model are largely transferrable. Training and materials may be adapted to meet local need and budget and recruitment may be tailored to demand. Matching within subregional areas or by location of home or work may address difficulties of time commitment and logistics, especially in regions covering a large geographical area. There is also potential to improve financial feasibility: using a cohort of trained peer mentors to train future mentors and/or tailoring peer mentoring training to the needs of local mentee populations may result in more focused and cost-efficient training. Care must be exercised in extrapolating our findings as our sample size is small (our budget supported the participation of only 18 pairs), precluding meaningful statistical analysis of quantitative data. Our questionnaires were not formally validated for evaluation of our objectives, and our control data, in particular, are limited. Furthermore, our findings are based on experiences of a self-selected, motivated group of trainees; however, involvement of a self-selected group is likely to be the case in any voluntary mentoring programme. We have demonstrated a demand for peer mentoring within paediatrics and shown benefits for both mentees and mentors. We have developed and implemented a successful programme, resulting in acquisition of a transferable skill set by participants with a self-reported impact in changing behaviour. Our programme serves as a useful model that may be adapted to allow education providers to offer this important experience to postgraduate trainees. Further work is needed to evaluate the longer term impact of participation in such a programme and to examine in more detail the comparison of those individuals who did not have access to peer mentoring. It will also be important to identify the need for and provision of peer mentoring support elsewhere in the UK and to investigate ways in which development of this process may be supported on a wider scale. The London Deanery Coaching and Mentoring Team for their encouragement and expertise in developing the programme. Members of the Supporting Trainees Subgroup, Trainee Committee of the London Specialty School of Paediatrics: Joanna Cryer, Tatiana Hyde, Andrea Leigh, Carrie Williams and Amutha Anpananthar for their contribution to developing materials for the programme and delivering training. Management Futures for providing coaching and mentoring training to our cohort of peer mentors. Standing Committee on Postgraduate Medical and Dental Education (SCOPME). Supporting doctors and dentists at work: an enquiry into mentoring. London, SCOPME, 1998.
. Improving hospital doctors’ working lives: online questionnaire survey of all grades. Postgrad Med J 2005;81:49–54.
. Repaving the road to academic success: the IMeRGE approach to peer mentoring. Acad Med 2006;81:674–9.
. Mentoring alternatives: the role of peer relationships in career development. Acad Manag J 1985;28:132.
. Peer-mentored research development meeting: a model for successful peer mentoring among junior level researchers. Acad Psychiatry 2008;32:493–7.
. Time for training: a review of the impact of the European Working Time Directive on the quality of training in the UK. Medical Education England. 2010. 31 January 2013.
. Mentoring for doctors in difficulty. Educ Prim Care 2012;83:27–9.
. Peer mentorship for medical students and junior doctors. Med Teach 2012;34:673–4.
. The OSCAR Coaching Model: Simplifying Workplace Coaching. Worth Consulting Ltd, 2009.
. Mentoring senior house officers. Is there a role for middle grade doctors? Emerg Med J 2001;18:259–62.
. 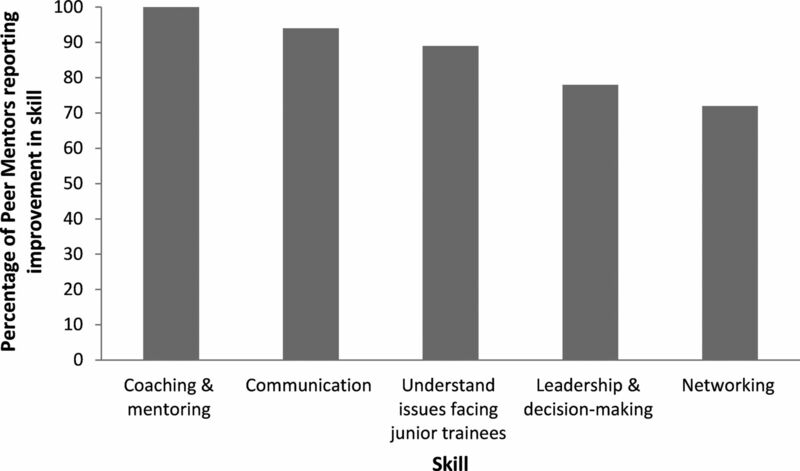 Developing senior doctors as mentors: a form of continuing professional development. Report Of an initiative to develop a network of senior doctors as mentors: 1994–99. Med Educ 2000; 34:747–53.
. Mentoring programs for medical students—a review of the PubMed literature 2000–2008. BMC Med Educ 2010;10:32.
. The importance of mentoring for junior doctors. BMJ Careers Focus 1998;317:S2–7151.
. Mentoring for NHS doctors: perceived benefits across the personal-professional interface. J R Soc Med 2008;101: 552–7.
. Educational contracts in family medicine residency training. Can Fam Physician 1994;40:549–6.
. A descriptive, cross-sectional study of formal mentoring for faculty. Fam Med 1996;28:434–8.
. Formal mentoring programs : the relationship of program design and support to mentors’ perceptions of benefits and costs. J Vocat Behav 2008;72:225–40.
. Facilitatory mentoring in general practice. BMJ Careers Focus 1996;313:S2–7060.
. Mentoring for doctors. Do its benefits outweigh its disadvantages? Med Teach 2008;30:e95–9.
. Mentorship behaviors and mentorship quality associated with formal mentoring programs: closing the gap between research and practice. J Appl Psychol 2006;91:567–78.
. Mentoring faculty in academic medicine. A new paradigm? J Gen Intern Med 2005;20:866–70.
. Effective faculty preceptoring and mentoring during reorganization of an academic medical center. Med Teach 2002;24:550–7.
. General practitioners ‘experiences of patients’ complaints. Mentoring should be more widespread. BMJ 1999;319:852–3. SE and SS are joint first authors. Contributors All authors contributed substantially to conception and design, acquisition of data or analysis and interpretation of data, drafting the article or revising it critically for important intellectual content, final approval of the version published. Funding The programme was funded by the Faculty Development Department of the London Deanery.